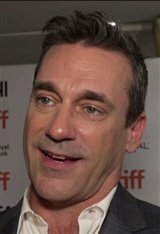 Jon Hamm first became interested in acting in the first grade, when he was chosen to play Winnie the Pooh. Later on, he received a scholarship to study acting at the University of Missouri. He worked for awhile as a drama teacher at John Burroughs High School in St. Louis, Missouri before moving to Los Angeles to pursue a screen acting career. His first foray into television was a guest-starring role in 2000 on the series The Hughleys. That year, he also made his big screen debut with a small part in the comedy Space Cowboys , directed by Clint Eastwood. His breakthrough role came when a small part on the TV show Providence turned into an 18-episode run. Jon then landed a starring role in the police drama The Division from 2002 to 2004, playing Inspector Nate Basso. He continued to find success on television, landing recurring roles in shows such as What About Brian and The Unit (both from 2006 to 2007). Since 2007, he's starred in the award-winning AMC series Mad Men. Jon has been nominated three times for an Emmy Award as Outstanding Lead Actor in a Drama Series for his work on the show, which explores the changing social mores of a Madison Avenue ad agency in the 1960s. For his portrayal of the duplicitous agency partner Don Draper, Jon also garnered a Golden Globe Award, two additional Golden Globe nominations, and three Screen Actors Guild (SAG) Award nominations, all for Best Actor in a Drama Series. In addition, he shared in two SAG Awards with the ensemble cast of Mad Men. In 2008, Jon returned to the big screen playing Michael Granier in The Day the Earth Stood Still . He was heard in the animated hit Shrek Forever After (2010) and co-starred with James Franco and Mary-Louise Parker in the independent feature Howl , which premiered at the 2010 Sundance Film Festival. He also played a starring role in Ben Affleck's critically-acclaimed film The Town , which screened at the Toronto International Film Festival. Since then, Jon has appeared in Zack Snyder's epic action fantasy Sucker Punch (2011) and the comedies Bridesmaids (2011) and Friends with Kids (2012). Next he starred in the Walt Disney baseball picture, Million Dollar Arm (2014), and lent his voice to the animated film Minions (2015). Jon played himself in the comedy Absolutely Fabulous: The Movie (2016), Tim Jones in the comedy Keeping Up with the Joneses (2016) and Will in the drama Nostalgia (2018). Also in 2018, he took on the starring role of a U.S. foreign diplomat who has to negotiate with terrorists in the spy thriller Beirut and joined Jeremy Renner and Ed Helms in the comedy Tag (2018). Most recently Jon returned to theaters in the thriller Bad Times at the El Royale (2018) where he played alongside Jeff Bridges and Chris Hemsworth. He is also set to appear in the upcoming film Top Gun: Maverick (2020) with Tom Cruise. Jon and his long-time partner actress/screenwriter Jennifer Westfeldt separated in 2015 after nearly eighteen years together. That same year, his representative confirmed he had completed inpatient treatment for alcoholism. New movies in theaters - Incredibles 2, Tag and more!